Two recent papers published in the Proceedings of the National Academy of Sciences are notable examples of using the CRISPR/Cas9 system to create somatic mutants to probe gene function. Mazo-Varga et. al (2017) and Zhang et al. (2017). 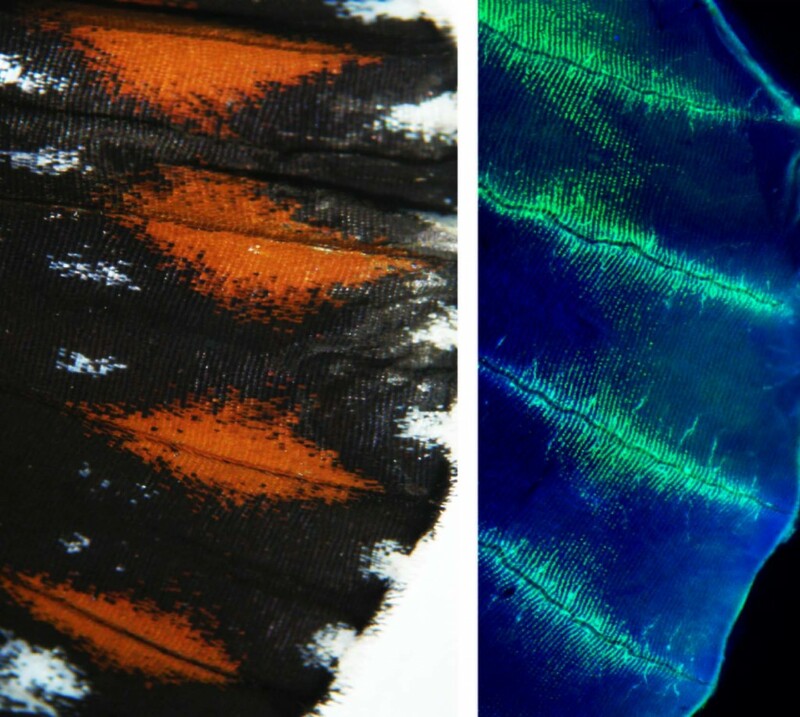 Both studies explore the functional genomics of butterfly wing-pattern diversity, development and evolution. A similar experimental strategy was used in each case. In lieu of making germline mutants and trying to establish mutant lines of the butterflies they focused solely on somatic mutagenesis and the phenotypic analysis of clones of cells with the mutant genotype. In both studies the authors collected appropriately aged freshly laid embryos (preblastoderm), injected them with CRISPR/Cas9 components and then examined the adult insects developing from those injected embryos for clones of mutant cells. Zhang et al. were studying the role of the gene optix in wing patterning of four species Heliconius erato, Agraulis vanillae, Vanessa cardui and Junonia coenia. optix is known to be involved in wing patterning based on prior genetic association studies, mapping and gene expression studies. Mazo-Vargas et al. investigated the role of WntA in butterfly wing patterning and studied seven species Vanessa cardui, Junonia coenia, Pararge aegeria, Agraulis vanillae, Danaus plexippus, Heliconius erato demophoon and Heliconius sara sara. Zhang et al’s strategy was to create long deletions using pairs of guide RNAs while Mazo-Vargas et al. used individual guide RNAs to create frameshift mutations and used different guides to control for off target effects. Clones of optix -/- cells in the wing lacked all pigmentation and were black with melanin and Zhang et al. suggest that differences in optix expression are responsible for much of the diversity in wing patterning seen in nymphalids. 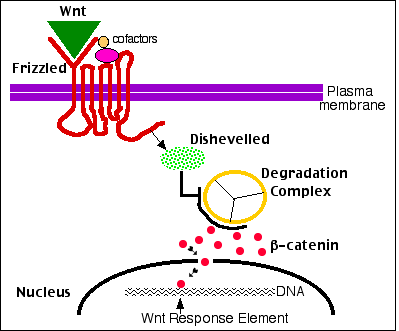 Mazo-Vargas et al found that Wnt-A to be involved in multiple patterning elements. 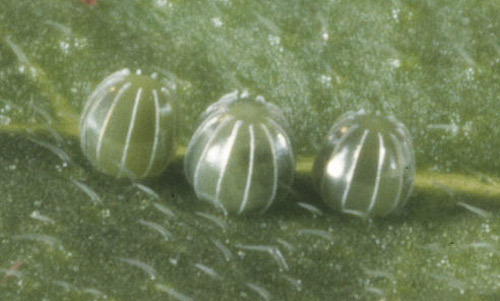 Eggs of the common buckeye butterfly, Junonia coenia Photograph by Jerry Butler, University of Florida. Each species presented different challenges for embryo microinjection. The chorions of J. coenia and V. cardui embryos need to be softened by treatment with benzylkonium chloride while the clusters of H. s. sara embyros needed to be separated and softened with a very weak solution of sodium hypochloride. Mazo-Vargas et al. reported injecting 5794 embryos of which 2293 hatched and 240 of those had mutant knockout clones. Clearly there was considerable effort involved in these studies but to think that seven non-model species of Lepidoptera could be the objects of contemporary functional genomics studies using the latest genetic technologies is remarkable and a testament to the power of current gene editing technologies and the industry and creativeness of the investigators. Zhang, L. & Reed, R. D. Genome editing in butterflies reveals that spalt promotes and Distal-less represses eyespot colour patterns. Nat. Commun. 7:11769 doi: 10.1038/ncomms11769 (2016).